Lovely venison stew. It is getting to be that time even here in California. This would defininitely be comforting Sylvie. What a lovely looking stew Sylvie - YUM! mmm, that looks awesome! Right now in MI it is 35 degrees, so this would be perfect! What a lovely looking stew! 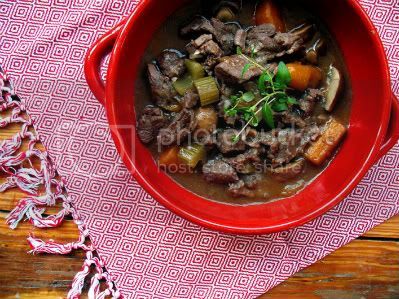 We just made a nice venison stew the other night with mushrooms, wine, and shallots. I know it is backwards to the way some people think, but I like to know that a deer lived a full and wild life running in the woods before becoming venison -- rather than a cow or pig living penned up.